When you work with technology every day you very quickly fall into habits. Technology is largely designed to help us – be more productive, be healthier, be safer, etc – so here are my list of preferred pieces of technology that I like to use when I’m working on projects. For more information on how I work, you can visit: About Fred. I literally swear by my Apple products… at least two of them go with me pretty much everywhere I go. There are only a couple of times I might leave my Macbook at home and take an iPad instead. But in my line of work I find it really important to stay connected. A quiet 10 minutes in a coffee house whilst waiting for a meeting to start, or even on the train. It means if there’s just that little bit of code that needs to be tweaked I can do it right away. Plus Macs have Apache web server built in so it’s super easy to have a local copy of the project you’re working on on your local machine, make the changes then just Git Push the changes when you’re next connected to the net. You can also save sites and connections and arrange them into folders. It also has a built in GUI for Version Control either GIT or SVN. Plus iTerm2 brings some great features of Putty to the Mac, like saving profiles so you can automatically connect to a server using a shortcut key. I’ve actually wanted to use Slack for a while, but whilst being a freelancer I’ve never really had the opportunity to. However when I started to work with the team at Cranleigh School we quickly adopted Slack – gradually dropping the use of Basecamp. The amazing thing about Slack is that it actually does do what the developers claim. It reduces the amount of emails in your team. Emails are slow and tedious – now with Slack we can just message each other questions or comments… it’s all searchable and it’s there easily to check back on. The integrations that Slack gives are so helpful as well. For example each project that I work on has it’s own Slack channel so I keep all conversations well grouped. Each project that has a Github repo (most of them) will have the Github integration installed so I can see any Issues, Pull Requests, Commits that are new right from within Slack – no more emails, no more having to check Github.com regularly. I think this one is pretty self explanatory. I pay for the international calls package. I’ve found it particularly useful for the times when I’m abroad and what to call a client back home, or vice versa. Plus the SkypeIn number allows me to have a business line, without having to give my personal email out to the public. Having a GUI that can connect to MySQL databases is really useful. I quite like this one, it’s simple to use and very Mac Friendly. It does have a few oddities when it comes to formatting a SQL dump which have stumped me a couple of times. If you don’t like this I’d also suggest MySQL Workbench – which is the official app developed by the MySQL team at Oracle. When I’ve got a lot on, I’m often pretty useless as prioritising and remembering the little things that need to be done. I like to use Todoist like a checklist. Similar to the reason why I like Coda2 is that Todoist is a native Apple App that syncs across all your devices, and also has a web interface. So no matter what device you’re on you’ll always be able to see your todo list. I personally pay for the premium version so I can arrange things with colour-coded labels, receive reminders by email, or SMS (USA only), and attach extra data to notes including PDF attachments or even spoken voice recordings. I was introduced to Evernote when I was working at Global Radio back in 2011. Every employee was told to download it and we all got ‘training’ on how to use it. It’s perfect for note taking during meetings. Plus you can share the notes with the rest of your team afterwards. I learnt some sad news today. The Church – a club that only happens on a Sunday during the day – is to close it’s doors for the last time at the end of the month! It’s a bit of a strange concept to understand for anyone that hasn’t experienced it. But for those that have been and taken part they will almost certainly have some fond connection with the venue where you get given drinks in multiples of three in a goldfish bag with some water and ice (if you’re lucky)! To the uninitiated, The Church started in 1979 in a small pub on the Fulham Broadway. In the past 36 years it’s travelled to 11 different venues (we think moving either due to complaints or out growing each venue). It is filled, primarily with antipodean backpackers, a hand full of squaddies back home from service, and loyal “sinners”. Including a 50+ year old primary school teacher who goes almost every weekend and has been doing so since the early days! I won’t go into the crudeness of it too much but for the purposes of context, it’s a very ‘laddy’ atmosphere. The focus is on entertainment and that comes in the form of drinking, comedy (often with ‘knob jokes’) and an adult performer. – But don’t worry ladies, as the venue has become more popular there is often a male adult performer as well. So you can understand how I can class it as ‘laddy’. “Lads lads lads” – perhaps is a reason it is no more. Although the majority of my Church days are behind me, I had always thought of going back for one a couple of last hurrahs! 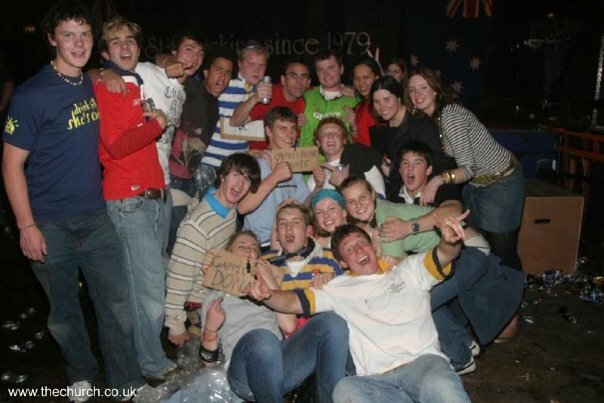 During my younger years immediately after I had come back from my gap year in Australia I spent a lot of time with my Australian friends that were over here on gap! I made so many friends and The Church often all brought us together. Whether you went planned as a group of friends or not. Chances were that after a couple of Sundays there’d always be someone there that you’d know, that you didn’t plan to see there. Plus, even the people that you didn’t know were nice. People understood that you move out the way for people where possible. The Tri Nations boats races were always the most hard fought races. Perhaps bar the odd Navy vs Army ones. The winning team would win a crate of VB cans for them and their friends. Yes, sawdust on the floor. It was a little bizarre if it was your first time, but genuinely genius. The policy of the event was “once you’ve finished your drink, put the can on the floor and stamp on it”. Because of this there were constant spillages on the dance floor area so putting sawdust down meant that the floor didn’t get sticky (great for those wearing flip flops). Whoever was in charge of the music playlist at The Church was a special person. They’d be the classic tunes that you’d come to expect. Every week at midday it would start with Reef – Place Your Hands. What then followed was a mixture of modern and classic rock. I’ve tried to curate the playlist myself from memory however it never sounds as good. There’s something about the acoustics in that room with beer flowing and sawdust on the floor! Week and and week out there was usually a theme of some sort. Australia Day was an obvious one, people dressed up in Green and Gold, the more ambitious dressing up as Australian icons like a Kangaroo, or rugby hero George Gregan. Once I went dressed up as Matty John’s alter ego ‘Reg Reagan. You had to make sure you got up early – which on a Sunday was hard. But on the big weekend people would start queuing from 10am, or even 9.30, despite the venue not actually opening until midday. I’d heard stories of the bouncers getting there to open up and there already being some people in the queue. You could drink in the queue, (bins were put out especially), so people would wander down Kentish Town highstreet to Iceland or some other small local supermarket to grab a 4 pack of beers to take back and start drinking before you got in. Not your ordinary bouncers. These guys were – in the most part – massive! One was an internationally acclaimed body builder who was still competing! They weren’t the kind of guys you wanted to get on the wrong side of. However due to the known awkward tensions between the event and the local Kentish Town community their main role seemed to be public order and community outreach. They were the first people you’d see as you all piled off the Northern Line – they’d be the last people who you waved goodbye to whilst you were on your way to Shepherds Bush. They made sure you crossed the road properly. They made sure you weren’t too loud for the neighbours. Basically they ensured that you weren’t too much of dickhead! The Church would normally finish up at about 4pm on a Sunday afternoon by which time the majority of friends would gather and head on somewhere else. Our particular chosen place was to Shepherds Bush Walkabout (now, sadly also closed!). It was about a 45-60minute journey to get there, which was a good thing as it allowed people to sober up a little. After a few more hours we were all knackered and it was time to catch the train home! Still half dressed up in whatever we arrived in, we must have looked a right mess on the Sunday evening train. But it was all worth it and we’d be back again the next time to live it all again! I found a really useful GIST from Scott Phillips which helps me each time I come to write an htaccess file. It’s an institution that marked my childhood! I’m sure you too, can remember going to Our Price, Virgin Megastore or HMV (or of course Woolworths or WHSmith) to get your hands on the double CD or double Cassette tape of the latest Now album. Once you bought that album it meant that you could finally re-use the tape that you very carefully recorded the same songs off the Sunday afternoon chart from the radio. The “NOW” branded albums have been going since 1983, and Mark Goodier has been the voice of the company since “Now 21” – which had Queen’s “Bohemian Rhapsody”, Madness’ “It Must Be Love” and Kylie’s “Give Me Just a Little More Time”. We’re now at NOW 87, and no doubt there are already big plans in place for the “NOW 100” album. But are they loosing their appeal? Earlier today @NowMusic, the official Twitter account for the brand posted a tweet: “Anyone been listening to #NOW87 on repeat? !”, the immediate response seemed to be a brilliant resounding no! It’s been of the most anticipated launches for a major metro radio market in a long time. Been talked about over the summer (out of survey) break by almost everyone. Even around the world people are talking about it (admittedly, radio geeks!). To fill you in. Kyle and Jackie O – Australia’s most popular FM breakfast radio show – left Southern Cross Austereo (whom they had each been with for over 10 years). Then with the announcement that the Australian Radio Network (ARN) were in discussions with them the speculation mounted. Eventually ARN announced that they were going to change Mix 106.5 (an adult contemporary station – similar to Heart in the UK) into a brand new station and Kyle and Jackie O were going to be on it! As you can imagine more speculation, and people started wondering what it would be called, etc etc. It was announced that it would be called Kiis (pronounced “Kiss” – I’ve never understood why!) and a launch date was set. I am writing as I believe I may have a story you might be interested in publishing (either online or in print) for your newspaper/news outlet. I have seen lots of similar stories in the past and mine has particular seasonal and festive ties. Last night while I was brushing my teeth (two minutes with the Oral B electric toothbrush my girlfriend got me for my birthday), I accidentally dropped/spilt a bit of toothpaste from the brush. I thought nothing of it and continued on. But then as I went to wash it away, I noticed a face staring back at me. A slightly disfigured face nonetheless, but – appropriately with Christmas a little over a week away – it looked as though the face was wearing a Santa Hat! Like I said, I’ve seen many stories like this in the past in your papers, and publications similar to it. “Jesus appears to me on my toast”, “Face of Gandhi appears in the carving out of butter/nutella”, etc etc. So I thought you might be interested in running my story. I have attached two pictures. First the original image, taken on my iPhone of face. And secondly, the same image, but in the form of a ‘meme’ that I posted to Facebook and twitter last night. PS, please excuse the state of the rest of the sink. I had just shaven.